Summary: Recently Nbeads has joined in affiliate program on Shareasale. As a professional jewelry beads supplier for 4 years, we have nearly seventy thousand beads in popular catalog. Recently Nbeads has joined in affiliate program on Shareasale. As a professional jewelry beads supplier for 4 years, we have nearly seventy thousand beads in popular catalog. Worldwide customers make our business runs well. As expanding the market, we are eager to cooperate with affiliates. We will offer a fairly high commission: 10%. If you have any other question about our affiliate program, please feel free to contact us: [email protected] (It is a work mail who can reply you quickly). 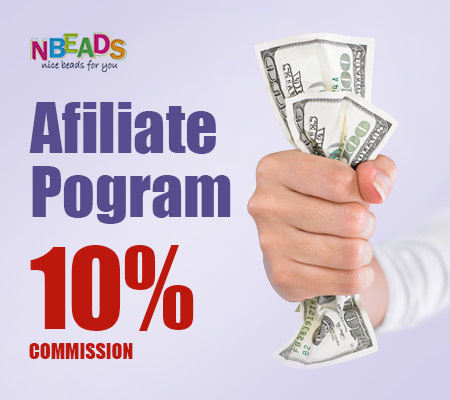 BTW, we would be more appreciate if you mail title is “Nbeads Affiliate Program”. Looking forward to your join and message. What is Happening! Post, Share and Win CASH!